"Adopted in 1917 as the result of a competition. The 13 stars in the outer circle represent the 13 original States. The inner semi-circle with 5 stars represent the 5 other States adopted into the Union before Indiana. The star directly above the torch symbolizes Indiana as the nineteenth State of the Union. The torch is a symbol of liberty and enlightenment." The flag was designed by Paul Hadley of Mooresville - adopted by the 1917 General Assembly. Its dimensions shall be three (3) feet fly by two (2) feet hoist; or five (5) feet fly by three (3) feet hoist; or any size proportionate to either of those dimensions. The field of the flag shall be blue with nineteen (19) stars and a flaming torch in gold or buff. Thirteen (13) stars shall be arranged in an outer circle, representing the original thirteen (13) states; five (5) stars shall be arranged in a half circle below the torch and inside the outer circle of stars, representing the states admitted prior to Indiana; and the nineteenth star, appreciably larger than the others and representing Indiana shall be placed above the flame of the torch. The outer circle of stars shall be so arranged that one (1) star shall appear directly in the middle at the top of the circle, and the word "Indiana" shall be placed in a half circle over and above the star representing Indiana and midway between it and the star in the center above it. Rays shall be shown radiating from the torch to the three (3) stars on each side of the star in the upper center of the circle. Whitney Smith, and others following him, habitually use the 26:33 formulation, but this is a bit misleading. This ratio generally applies to flags in the specific size of 4 ft 4 in by 5 ft 6 in (52 x 66 in), the regulation size of U.S. infantry and artillery colors at the time the Indiana state flag (and many other state flags) were adopted. Many of these flags were adopted primarily to be carried in parades and other ceremonies, and legislatures often specified the then-current size of national colors to apply to state flags. The same would apply to the fringe attached to them, which (following the military example) would be 2 1/2 inches wide. I imagine that Indiana flags were seldom if ever made for hoisting in the 52 x 66 inch size, and I have to believe that the 1979 law is current. Indiana's state seal has a frontiersman chopping a log and a bison running away to the west. The torch and stars were designed specifically for the flag. The state military crest, which is the crest used in the coats of arms of units of the National Guard, as granted by the precursor organizations of what is now the Army Institute of Heraldry. The official Institute of Heraldry blazon is "A demi-lion rampant argent, holding in dexter paw a laurel branch vert." The flag is described as "Custom Outdoor Sheriff Flag. 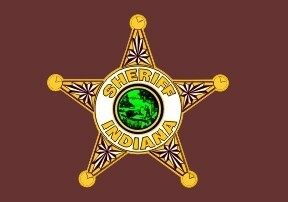 Brown with Indiana Sheriffs Association Logo silk screened in gold. brown and green. Flag reads correctly from both sides and is equipped with canvas heading and brass grommets."